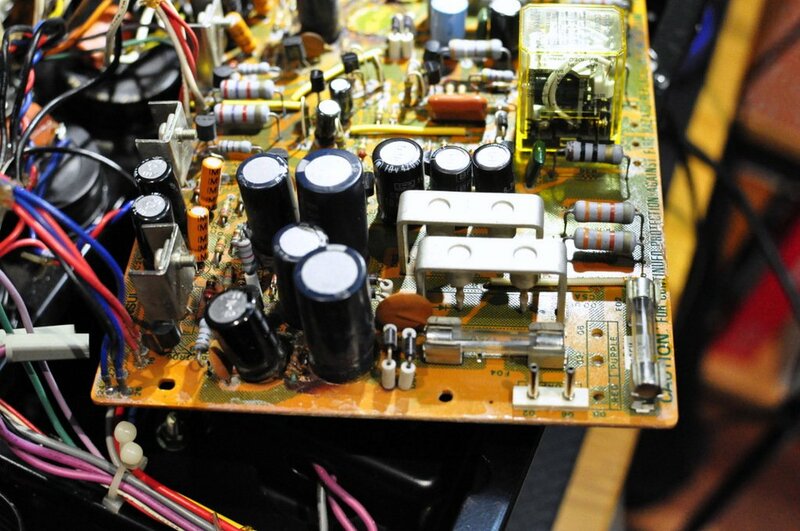 The infamous Sansui corrosive glue problem is one that affects many vintage hi-fi amplifiers and other equipment. Resolving issues caused by this glue is time-consuming, but essential. You maybe familiar with the scenario – over time, your favourite Sansui (or other) amplifier starts to develop faults. Maybe it won’t come out of protection, or maybe a channel becomes intermittent. Most equipment manufactured by Sansui, and others, during a certain period in the 70’s and 80’s will be affected by a nasty, corrosive glue compound. Its called polychloroprene and, in certain situations, it literally eats through components like an acid. Polychloroprene has been around for a long time, since 1931 in fact. It’s a powerful and long-lasting contact adhesive used in many industries. You can read more about polychloroprene and its properties in this fascinating article. Many electronics manufacturers used polychloroprene glue to secure capacitors to circuit boards. It effectively reduces vibration and therefore improves sonic performance and reduces the risk of vibration damage. However, it seems long-term testing to see what would happen to the parts held down by the brown glue wasn’t done. The result is a huge number of problems caused by the glue eating through components in gear from this period. This is a classic example of the glue and what it looks like in most cases. Here, the glue is visible around the edges of the large black capacitor. Note the dried appearance, which is good, and the damage it has caused to the resistor in between the two capacitors, and the diode leg to the left, which is bad. That’s right, the glue these manufacturers used is corrosive. I’m sure this was not well understood at the time, but it creates big problems. What happens is that the glue, whenever it touches tin-plated copper legs of components, literally eats through them. This can be so bad that I’ve worked on gear where components have literally fallen off the board when I’ve touched them. The amplifier I was working on when I originally I wrote this article was no exception, several parts were so badly damaged they were just hanging off the board. This Sansui AU-717 board is badly affected by corrosive glue. 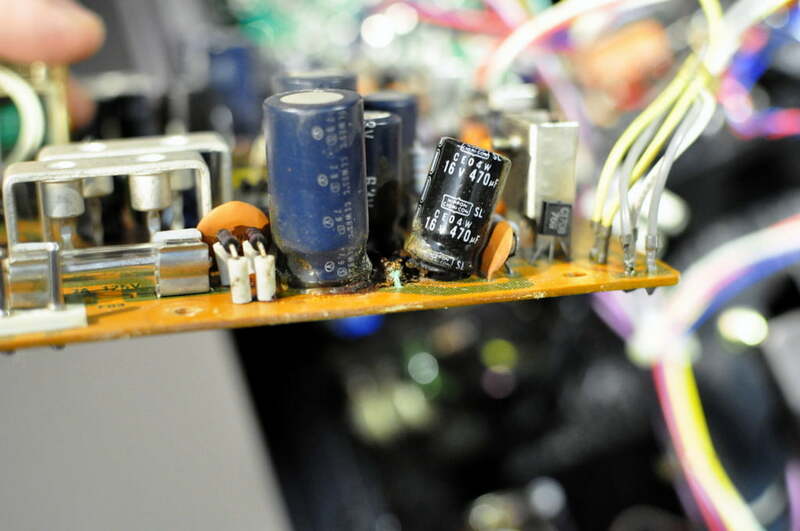 The capacitors in the foreground have been destroyed by the glue and must all be replaced. Note that the one on the bottom left is pushed upwards and to the left, due the expanding mass of corrosion underneath it. I wish I could say this is just a Sansui problem, but it’s not. There’s no doubt that Sansui loved this glue, it causes havoc in virtually all of the AU series of amplifiers, plus a whole bunch of other stuff they made. But it’s also found in Marantz amplifiers and receivers, and a whole bunch of other gear, especially from Japan. This capacitor came out of a Marantz 2226B that I repaired in August, 2018. Note the complete destruction of one leg and expanded, corroded base. This corrosive polychloroprene glue will destroy circuit board traces, eat through component legs and even dissolve the parts themselves. Anywhere you find this dark brown glue, it must be carefully removed from boards and parts. If the glue is hard and crumbly, I find it easiest to scrape it off with a hard tool, like a flat blade screwdriver for example. If the glue is still pliable, it can be much more difficult to remove. Often a combination of acetone and a scraping tool will work best in these situations. The idea here is to soften and loosen the polychloroprene before scraping it off. However you remove it, leave as little remaining as possible. You must also carefully examine the leads of any parts that have been exposed to this compound for signs of corrosion. Replace affected parts where necessary and if in doubt, err on the side of caution and replace the part. The Sansui AU-717 amplifier I restored for my customer and which prompted me to originally write this article needed many new parts. This is what I’m talking about. You can see the green oxidised copper on the remains of the resistor, between the two capacitors. All the capacitors here must also be replaced. 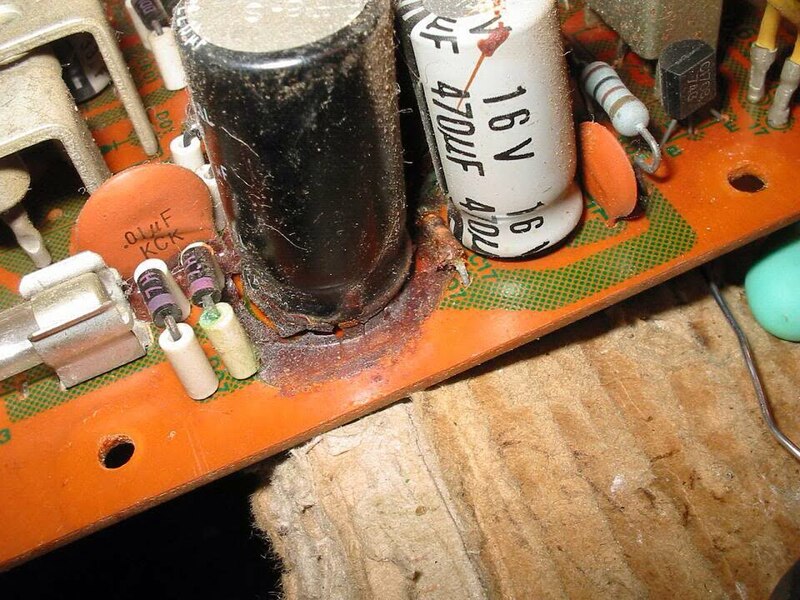 More affected capacitors, in a Sansui AU-717. what do you charge for Sansui AU-717 Amp recap and restore? Hi Jack, I’ve emailed you about this so hopefully you received that message. Prices vary somewhat according to the condition of each individual piece, whether new main filter capacitors (expensive items) are required, level of corrosion of boards etc. It is best if I inspect the equipment and then give you an estimate. Be aware that there are really only one or two people in Western Australia who work on gear like this to the standards you see here on these pages. There are some very poor operators out there and you absolutely don’t want someone like that working on gear like this! Regards, Mike. Hi Sam, good work fixing your CD player. Yes these Sansui amplifiers are extremely well designed and engineered, apart from some production engineering decisions like using that glue!